Jenny Paterson’s excellent articles on the German vinedressers, in the Burwood and District Family History society’s magazine, Ances-Tree. Jenny warns that some of the unassisted emigrants appear to have slipped through the Hamburg documentation nets. Colonial government Board Immigrant Lists and related indexes for New South Wales, the colony which was sponsoring the big push for German and other European, vinedressers. These include more information than the Agents Immigrant Lists which are available online. Victorian immigration records for unassisted immigrants to the colony and thence forward emigration to other colonies or overseas. I often use these in combination with the NSW records to tease out differences, find anomalies, and pursue further research. Trove, the Australian online central access point for digitised newspapers and photographs (try people or ship’s names) as well as books or magazine articles. It may also provide clues to where your ancestors were working in those first couple of years in the colony. Australian Parish records and state-based BDM records and indexes are also invaluable in determining location and the emigrant’s place of origin. (Do use wildcards if they’re available as the German names get mangled!) Unfortunately since the vinedressers were sponsored as families, and many of them were close to the end of the child-bearing years, this is more likely to be useful for the teenagers who arrived or the children born after arrival. I’m a huge fan of parish records because they’ve broken down brick walls for me a number of times. (Don’t forget to send a donation or ask the cost if you request this information). Some of the earlier ones are available on microfilm through the NSW ARK kits. More recently we have another resource which can add invaluable information on our ancestor’s emigration from their home village, the digitisation of some old German newspapers which can be accessed through Google Books. You do however, have to have a good idea of where your ancestor came from for these to be useful otherwise it’s very much a needle in a haystack. Last year I wrote about the challenges of these searches and there’s no easy, reliable or comprehensive gateway into them. It all makes you appreciate Trove all the more <smile>! These are the links to my earlier posts: here and here. You might also be interested in this more general post about finding your German ancestors. Over the past few days I’ve been back in the depths of these digitised German newspapers, hunting for more information on the emigration of “my” Germans from Dorfprozelten on the River Main in Bavaria. Rather like searching through microfilms this task requires determination, good eyesight/glasses, and patience….lots of patience! As I find articles I tag them in Diigo, clip them to Evernote then copy and paste the screen into Photoshop. Finding them is the challenge however. Start out by searching for your ancestor’s village. Remember too that the search does not like it if you use only part of the word eg Australien may work but Australie won’t. 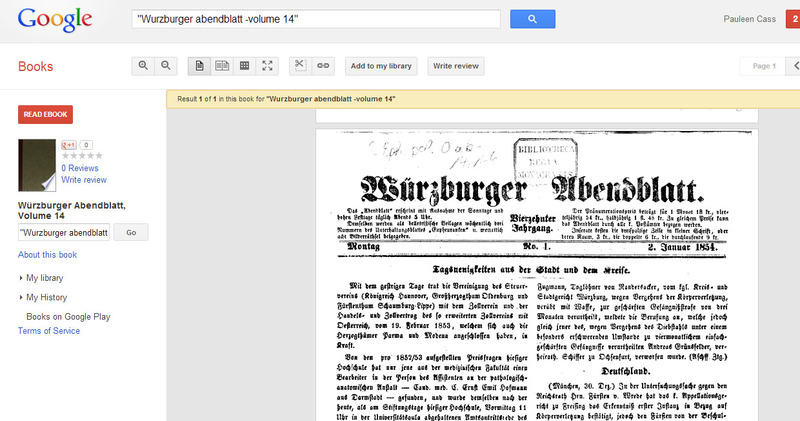 Initially I found through an advanced Google book search, that the Würzburger Abendblatt newspaper, Volume 14, produced the most results if I searched for “Dorfprozelten”, specifically in relation to 1854, the year of the big migration. Strangely however if you just enter “Würzburger Abendblatt” in your Google book search it provides you with limited options. If you change your search to “Würzburger Abendblatt-Volume 14”, however, you will find that this one suddenly appears as an option. From there you can make good guesses about what volume you require for years before or after 1854 eg Volume 12 or 20. Don’t ask me why this is so, but it does seem to get around the glitch. Once you have loaded the relevant page in the volume, you can then enter a different search term in the box on the left hand side. Try a range of lateral options: name, village name, nearest town or railway station, or a term like “auswanderer”. Strangely the bold topic headers (eg Termin-Kalender) within the paper are often not productive, yet a sub-heading (eg Stadt und Kreis) may be. It really is a case of try, try again. I’ve often got a “no word” response yet later found that same word within another successful search. Perseverance is key. If all else fails, and you know roughly when your emigrants left home, scroll through the pages looking for those headers and then scrutinise each entry carefully. It’s just like reading a microfilm only online with a coffee beside you. Emigrants were required to notify their creditors of their forthcoming departure so all debts could be settled, and in some cases, possessions were sold. As with our legal notices it seems likely that the information was published in more than one paper, so as well as the Würzburger Abendblatt (WA) some notices were also found in the Aschaffenburger Zeitung (AZ). Jenny Paterson has indicated that people from the Unterfranken area of Bavaria, and also those across the River Main in Baden, usually advertised in the Main- und Tauberbote but unfortunately that has not been digitised and as far as I can tell is unavailable in Australia. Is it worth your while to go to this much trouble? I guess it depends on your urge to know more, but I’ve found some interesting things. Check in for the next post which will talk about the specifics of these Dorfprozelten emigrants and then what I found about them in the newspapers. You may find my earlier post about immigration resources helpful.